For surveillance operations, the unique Mission Critical Wireless Bluetooth Covert kit provides the accessory options an undercover officer needs when heading out for duty. 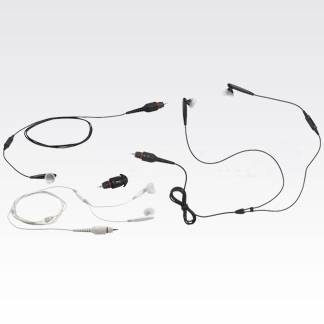 This covert kit includes 2 sets of two-wire earbud headphones (1 black and 1 white), a single-wire black earbud headphone and an industry unique 3.5mm adapter that allows the officer to plug in any consumer off-the-shelf headphones. A Mission Critical wireless push-to-talk pod (NTN2571)&amp;nbsp;must be ordered separately to power the earpieces. Having these options available gives the officer the opportunity to match the right discreet accessory to their surveillance needs for that day.